France has issued arrest warrants for two former Russian athletics officials as part of an investigation into a doping cover-up. Valentin Balakhnichev is a former head of Russian athletics and Alexei Melnikov an ex-Russian national team coach. Both were banned from athletics for life in 2016 after widespread, state-sponsored Russian doping was uncovered. Mr Balakhnichev said he believed the arrest warrant to be baseless. The investigation started in November 2015 when the former International Association of Athletics Federations (IAAF) chief, Senagalese businessman Lamine Diack, was charged with accepting millions of dollars to cover up doping by Russian athletes. In 2017, a warrant was also issued for his son, Papa Massata Diack, accused of involvement in a corruption scheme in international sports. Sheltering in Senegal, he has been on Interpol's most wanted list for four years and denies the allegations. The investigation is French-led as funds are believed to have been laundered in France. 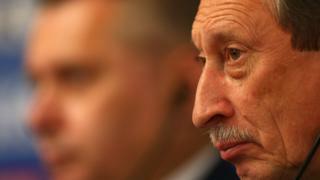 Russia was suspended from the IAAF in 2015 after the doping scandal was uncovered but some Russians have been permitted to compete under a neutral flag if they can prove they have not been involved in doping.